The Big Wobble: Yesterday's massive bombing in Somalia's capital Mogadishu death toll rises to more than 230 with hundreds more injured. 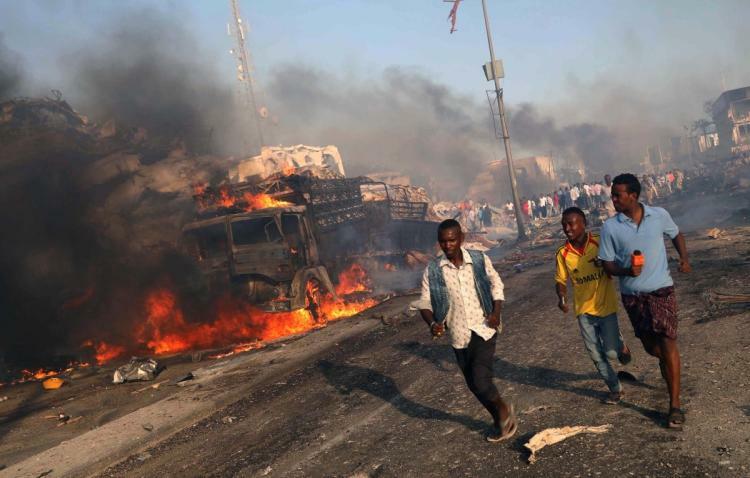 Yesterday's massive bombing in Somalia's capital Mogadishu death toll rises to more than 230 with hundreds more injured. Local journalists say one freelance journalist is among those killed in yesterday's massive bombing in Somalia's capital and several others were injured. Voice of America says one of its reporters, Abdulkaidr Mohamed Abdulle, is among the injured. The death toll from twin bombings that led to massive explosions in Somalia's capital has risen to 231 with 275 others injured, says Senator Abshir Abdi, citing doctors at hospitals he has visited in Mogadishu. Police and hospital sources say this is the single deadliest attack ever in the Horn of Africa nation. Doctors are struggling to assist hundreds of horrifically wounded victims, with many burnt beyond recognition. "There's nothing I can say. We have lost everything," wept Zainab Sharif, a mother of four who lost her husband. She sat outside a hospital where he was pronounced dead after hours of efforts by doctors to save him from an arterial injury. Somalia's government has blamed Saturday's truck bombing in Mogadishu on the al-Shabab extremist group, which has not commented. President Mohamed Abdullahi Mohamed declared three days of mourning and joined thousands of people who responded to a desperate plea by hospitals to donate blood for the wounded victims. "I am appealing all Somali people to come forward and donate," he said. "The hospital is overwhelmed by both dead and wounded. We also received people whose limbs were cut away by the bomb. This is really horrendous, unlike any other time in the past," said Dr. Mohamed Yusuf, the director of Medina hospital. Overnight, rescue workers with flashlights searched for survivors trapped under the rubble of the largely destroyed Safari Hotel, which is close to Somalia's foreign ministry. The explosion blew off metal gates and blast walls erected outside the hotel. Somalia's government has blamed the al-Qaida-linked al-Shabab extremist group for the attack it called a "national disaster." However, al-Shabab, which often targets high-profile areas of the capital with bombings, had yet to comment. "They don't care about the lives of Somali people, mothers, fathers and children," Prime Minister Hassan Ali Khaire said. "They have targeted the most populated area in Mogadishu, killing only civilians." The International Committee of the Red Cross says four volunteers with the Somali Red Crescent Society are among the dead. A statement Sunday says "this figure may rise as there are a number of volunteers still missing."